It’s not just about your dressmaking business anymore – it’s about managing the most prestigious ball of the Rococo era! On the surface Rococo is a game about making beautiful coats and dresses for noblemen and ladies attending a prestigious ball. 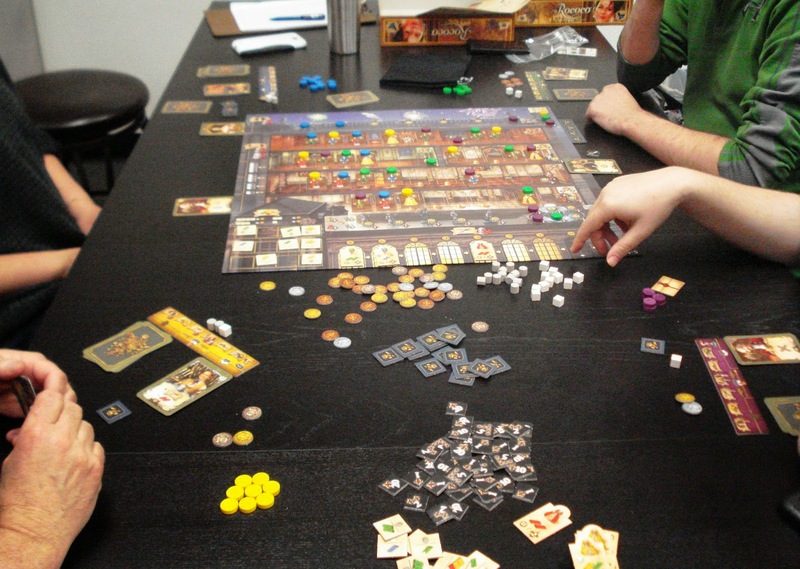 At its core Rococo is a very strategic board game. Players begin with 5 employees of varying abilities and a little money. In each of the 7 rounds players will get to select 3 employees to play. Each employee yields one action and sometimes a bonus action. A few select master employees can recruit new employees or they can make special dresses/coats to occupy prestigious locations in 1 of the 5 ballrooms. Other employees can gather materials of silk, lace, and thread, or make a dress, or fund a decoration in numerous locations, or even claim the queen’s favor to lock up “first player” for the next round. Players must cycle through their employee deck before they are allowed to reuse employees that have been played. The goal of Rococo is to score the most prestige points. Points are awarded for each dress/coat you made, each ballroom where you have the majority of dresses/coats, for decoration spots that you occupy, and for some combinations on employee cards acquired late in the game. Additionally, points are awarded for combinations triggered by decorations on the terrace and on the monuments. Bonus points are awarded for being the 1st to put something in each ballroom. As you can see, there are many opportunities for accumulating points. Money is important throughout the game. New employees must be paid for, dress/coat materials must be paid for, and decorations must be paid some of which are expensive. Completed dresses/coats can be sold rather than going to the ball. Additionally, income is paid at the end of each round. Rococo is a game that will require multiple plays to really get a handle on. But it won’t be hard to get those plays in. The game brings a little bit of deck building, some resource management, and a number of different ways to get points. Roll that in with a beautiful board, good components, and balanced game play and you have a winner of a game even if you are not the best dressed at the ball. 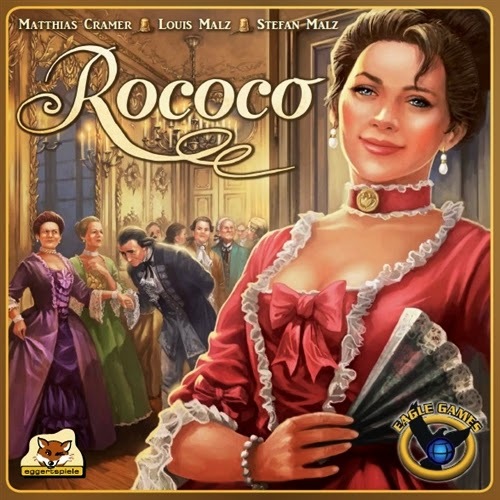 We have an open copy of Rococo available in our Demo Games Library for you come in and try.